On to Victory is the little-told story of the tense final days of World War II, remembered in the Netherlands as “the sweetest of springs,” which saw the country’s liberation from German occupation. The Liberation Campaign, a series of fierce, desperate battles during the last three months of the war, was bittersweet. A nation’s freedom was won and the war concluded, but these final hostilities cost Canada 6,298 casualties, including 1,482 dead. With his trademark “you are there” style that draws upon official records, veteran memories, and a keen understanding of the combat experience, Mark Zuehlke brings to life this concluding chapter in the story of Canada in World War II. 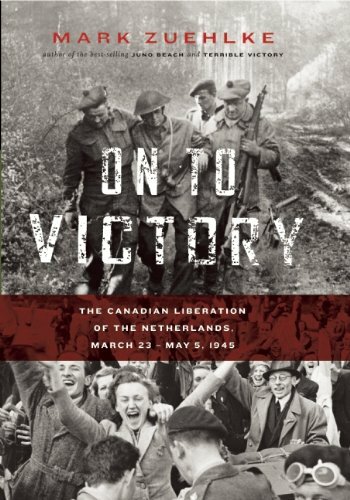 Published to coincide with the 65th anniversary of Canada’s dramatic liberation of Holland. May 4, 2010, will mark the 65th anniversary of the end of the fighting for Canada’s army and the conclusion of the Netherlands’ liberation. Major events of remembrance, both here and in the Netherlands, will celebrate this milestone. Troopers at No.2 Canadian Armoured Corps Reinforcement Unit (C.A.C.R.U.) buying bonds during the Fifth Victory Loan campaign, England, 13 October 1943.